Historian Bruce Catton believed George Henry Thomas was "certainly one of the four or five best soldiers on either side in the whole war." Reading Brian Steel Wills' definitive biography of the blue Virginian makes it clear why Thomas is now ranked among the pantheon of Civil War generals. Known as "The Rock of Chickamauga" to history and "Old Pap" to his men, Wills vividly documents the personal complexities of the man that contributed to his capabilities as a soldier. 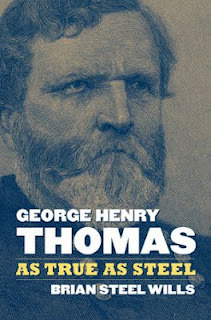 Thomas left no personal papers but Wills has diligently mined previously untapped bibliographic source material to present a nuanced, evenhanded evaluation of the soldier William T. Sherman called "true as steel." Born into a slave-holding family in Southampton County, VA, Thomas witnessed Nat Turner's great servile uprising of 1831 as a teenager and fled with his family through fields and marsh to reach the safety of the county seat. "The event," Wills maintains, "surely presented him with a starkly drawn firsthand picture of the volatility and dangers inherent in a system of forced labor." Thomas graduate West Point in 1840 and embarked on a military career that would last the rest of his life. He fought the Seminoles in Florida, Mexicans along the Rio Grande, and Kiowas and Comanches in Texas. He also found time to court and marry Frances Lucretia Kellogg of Troy, NY and return to West Point as an instructor. When Virginia joined the Confederacy, many wondered what Thomas would do. For him, there was never any question. His loyalty to the uniform he wore and dedication to the nation it represented was strong, steady, and unwavering, much like the man himself. His decision cost him dearly; his sisters never spoke to him again. Thomas' success on the battlefield is unrivaled. He gained the Union's first significant victory at Mill Springs, KY, reminded his commander that "this army doesn't retreat" at Stones River, stood steadfast on Snodgrass Hill and saved the Army of the Cumberland from destruction at Chickamauga, vowed to hold Chattanooga "'til we starve," proudly watched his men storm Missionary Ridge, and achieved the closest thing to a battle of annihilation by destroying the Army of Tennessee at Nashville. Thomas was not given to making speeches, but when he bid farewell to his beloved army, his praise was heartfelt and eloquent. "We have not only broken down one of the most formidable rebellions that ever threatened the existence of any country," he said, "but the discipline of the Army of the Cumberland alone has civilized two hundred thousand valuable patriots and citizens." Wills poignantly recounts Thomas' unsettled postwar years. He refused to play the political games practiced in the peacetime army nor would he become a self-promoter for post or rank. His ire was aroused, however, when his achievement at Nashville was questioned. Thomas died at his post at the Presidio in San Francisco on March 28, 1870 while serving as commander of the Division of the Pacific. In 1879, his comrades in the Society of the Army of the Cumberland unveiled a magnificent bronze statue of Thomas in Washington, DC. He is mounted on his horse, sitting ramrod straight, hat off, surveying the country he did so much to save.